What exactly does Will mean by “vulgar”? Is it an epithet that Washington arbiters of taste use to describe the regular vernacular and humor of everyday Americans? If you eschew complex ambiguity in favor of language that everyone can understand, does that make you vulgar? In a nod to personal liberty, Will grants that Trump’s “squalid performance and its coarsening of civic life are costs of freedom that an open society must be prepared to pay.” Yes, democracy is like that. It is exuberant, and accommodates a glorious diversity of taste and expression. “Life, like a dome of many-colored glass,/Stains the white radiance of Eternity,” wrote Percy Bysshe Shelley in Adonias. I, for one, adore the stunning display of colors and shapes with which God endowed this world. There’s room here for the Trumps as well as the Wills. Eternity with its white radiance can wait. Will describes Trump’s performance as “squalid,” and contends that he “coarsens” civic life. “Squalid,” with its connotations of filth and corruption—of something that requires sanitization—is a surprising choice of words. Surely, this is an overreaction. But then what kind of conservative would satisfy Will? Well, you’d have to go back 60 years, to a golden age when Bill Buckley made “conservatism intellectually respectable and politically palatable.” That would be the same Bill Buckley who, in a debate with Gore Vidal, exploded, “Now listen you queer. Stop calling me a crypto-Nazi or I’ll sock you in your goddamned face.” Even the most righteous of conservatives, then, have a coarse streak that emerges when they’re provoked. Rage is sometimes only a normal reaction, and the absence of passion in the face of slanderous provocation can be pathological. Interestingly, Canadians are more tolerant than Americans of this sort of behavior from their politicians. In 1996, when Prime Minister Jean Chretien’s public address was disrupted and cut short by rowdy protesters, he plowed into the crowd, grabbed one of them by the neck and forced him to the ground. He then knocked the megaphone from the hands of a second protester, and went on his way. Canadians loved him for it. The neck-hold came to be known as the “Shawinigan handshake,” named for Chretien’s hometown. 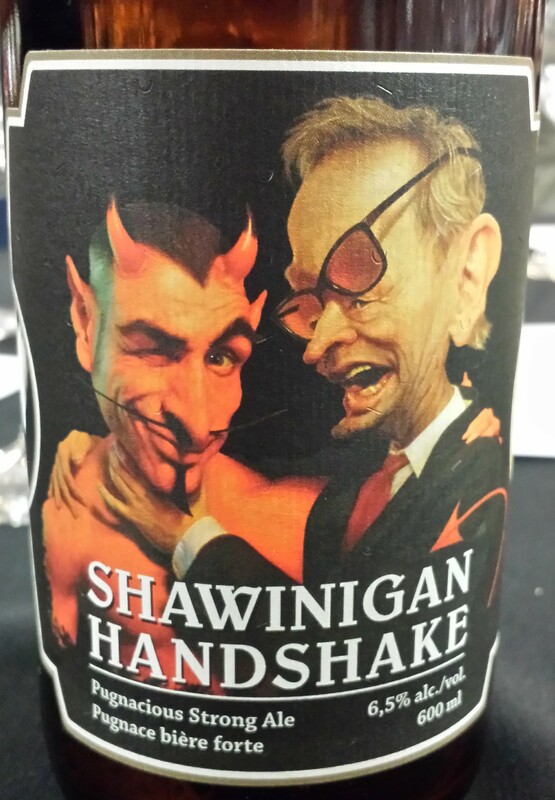 Today, an illustration of Chretien applying the famous handshake to a Canadian hockey personality graces the label of a microbrew, Shawinigan Handshake Pugnacious Strong Ale. Trump’s message resonates with working class stiffs who believe that, despite his wealth, he understands them and their concerns. When he speaks, they understand him. There’s no complex grammar to parse. And there’s none of the phony folksiness you get from the Dems, none of the sho-nuffs and y’alls from a Hillary. To many ordinary Americans, Trump represents the promise of America as a land where everyone should have an opportunity to make it to the top if he works hard enough. These are the folks who gave the last election to Barak Obama because he made this promise, and now they’re disillusioned. But Will can’t accept that these folks might be or become Republicans. To Will, these “Trumpites” are more plausible as vulgar Archie Bunker Democrats than they are as Republicans. So let’s ignore them. Cleansed? Sounds like an exorcism. Many Ruling Class Republicans seem to suffer from Trump Derangement Syndrome. To these folks, the Trump-Kelly dust-up was the last straw. Writing in the Post, Jennifer Rubin bellyaches that Trump “whines,” “bellyaches,” and “complains.” Even (gasp!) “during the debate.” Trump had the unmitigated chutzpah to call out a member of the sacred media priesthood when she was behaving unprofessionally towards him. Genteel Republicans don’t do that. And win he did, Most candidates beg the media to cover them. The reverse is true with Trump. After the dust-up with Kelly, it was Trump who black-listed Fox when he was doing the Sunday news shows, and Fox begged him to come back and make up. Wanna bet that in the future a debate moderator will think twice before treating Trump unfairly? Trump was clearly bewildered. There’d been many shows, and he didn’t remember everything that was said on every one of them. The context in which Trump made this statement was a conversation he’d had with contestant Brande Roderick and rock star Bret Michaels. “Excuse me, you dropped to your knees?” Trump interrupted. “That must be a pretty picture, you dropping to your knees,” Trump said. See anything demeaning in this banter? Brande didn’t. In fact, she was so outranged by the unfairness of Kelly’s nasty implications that she jumped to Trump’s defense: She didn’t remember the comment. Besides, this was a TV show; people were having fun being funny. And Trump had always treated her with respect. She’d witnessed the way he treats his daughter, “like a princess.” To Brande, the way a father treats his daughter reflects his attitude toward women generally. As a woman and a mother of a daughter, I can say that this is a very astute observation. Then, another contestant, Omarosa Manigault-Stallworth who, during the Clinton administration, had worked in Al Gore’s office, leapt into the fray and described Kelly’s questioning as “the lowest form of journalism,” comparing it to “going through somebody’s trash and cherry-picking.” And contestant Katrina Campins piped up that it was unfair to criticize Trump for things he’d said when he was being an entertainer. Anybody but an overly intellectualized pundit could surely see that. It was clearly a joke! The Stump for Trump girls got that it was a joke, but they were not amused at Kelly wasting valuable debate time on inanities. These are two African American ladies whose website boasts a delightful series of short videos where the sisters analyze issues facing Americans today, including the abysmal employment situation facing African Americans under Obama’s leadership. In their opinion, there are lots of urgent issues—including unemployment—that have much more salience than the one Kelly brought up. Based on all that they’d heard Trump say in the past, they thought that he was the best man to deal with the issues that affect the lives of every-day Americans. George Will is not the only Ruling Class Republican to express contempt for Donald Trump. And some express even more contempt for those who like him. Writing for National Review Online, Charles C. Cooke calls Trump a “virus.” (What is it with these misophobics?) and those who like him are ill, infected. You can recognize them because “by their dull, unreflective, often ovine behavior, they resemble binary and nuancless drones.” Nuancless? Choosing Trump for the presidential nomination, explains Cooke, is “comparable…to a person’s choosing a disabled man to run in a marathon.” Who would do something like that? Oh, wait. The disabled do compete in marathons, and have done so with pride since 1972. I’m sure that Cooke didn’t intend to diss the disabled. The problem for Ruling Class Conservatives like Will and Cooke, is that the Left has emasculated them. They tremble lest they let slip a faux pas that the Left can jump upon. They must at all times show that their Conservatism is “intellectually respectable and politically palatable,” and worry that Trump will make them look bad to the Liberals and their media. They are unable to grasp the fact that, notwithstanding all their efforts, the Left will never regard them as respectable and palatable. To achieve that goal, they must first become Liberals themselves. Trump makes it clear that he doesn’t give a damn what Liberals think of us. And everyday people of all political persuasions applaud when he stands up to the self-important elitist media, just as they did with Newt Gingrich in 2012. It’s time for the Right to man-up. Emulate Donald Trump and the Canadians.